Thousands of people took to the streets of Dublin today for a rally in support of the striking nurses and midwives. The Irish Nurses and Midwives Organisation (INMO) said on Twitter that they had heard estimates of 45,000 people turning out for the march. The rally began at the Garden of Remembrance and went through the capital, before going to the back of Leinster House at Merrion Square. 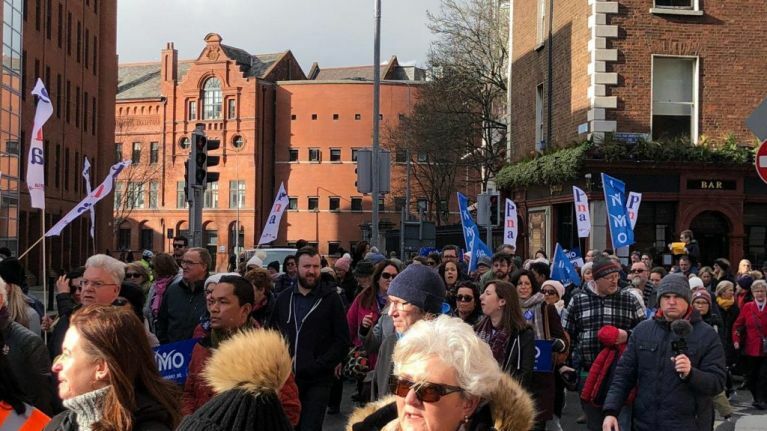 The INMO, who organised the rally, had asked anyone "whose lives have been touched by nurses and midwives to stand with us" and join the march. Student nurses and midwives with suitcases led the rally, calling on the government to give them a reason to stay and work in Ireland. The march followed three days of strike action in the last two weeks. Three more strike days are planned for the next week. Exploratory talks between the health chiefs and the INMO, along with the Psychiatric Nurses Association, resumed this afternoon.